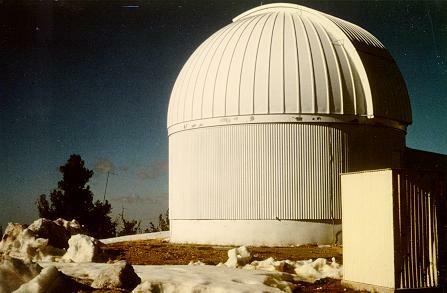 Part of my dissertation work was done on the 60-inch (1.5m) telescope here, not to be confused with the University of Arizona's 60-inch telescope a few hundred meters away or its 61-inch telescope a few kilometers downhill at Mt. Bigelow. 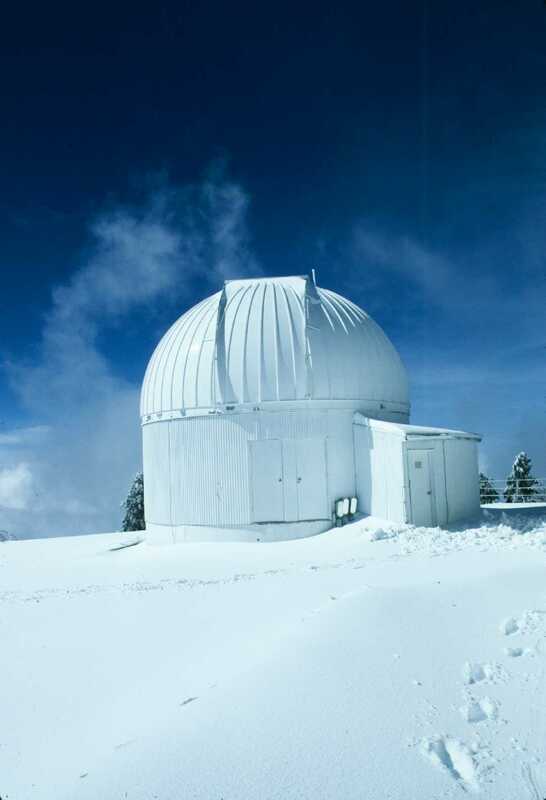 This one is operated by the University of California, San Diego, and the University of Minnesota, and has been most used for infrared work (especially when it was first built with a metal mirror, an excellent tactic for keeping those pesky optical observers away). 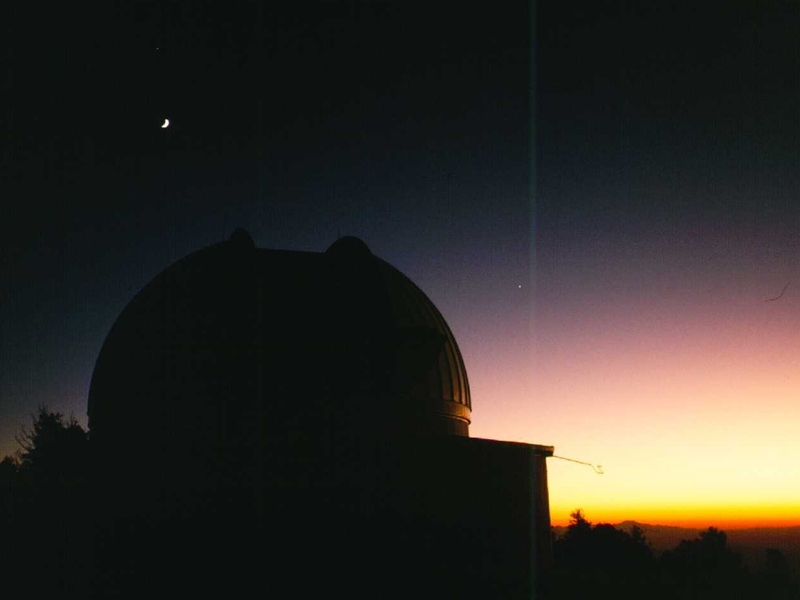 The twilight view above shows Kitt Peak on the horizon just to the right of the dome (about 120 km away), along with Venus and Jupiter (just above the moon). 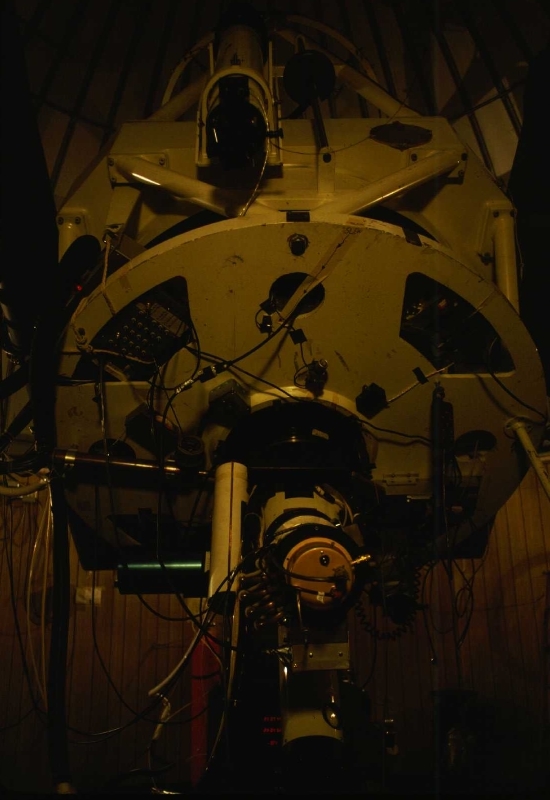 This telescope was equipped in the 1980s with a clone of the Lick spectrum scanner, and not only did it have 2.25 times the light grasp of the Nickel telescope, but they would hand it to grad students. In week-long blocks. The most notable thing I did here was a large survey of the nuclei of interacting galaxies, done with Rob Kennicutt, Thijs van der Hulst, and Ko Hummel. Here I compare optical spectra of several galaxy nuclei, including the old stellar population of the elliptical galaxy NGC 3379 , the fading starburst population of NGC 4569 (especially seen in the Balmer absorption lines at the blue end of the plot), and the mildly active nuclei of NGC 3998 and NGC 3312 (a giant spiral probably a bit in front of the Hydra cluster Abell 1060). The NGC 3379 spectrum shows how complex the underlying starlight can be; I went to a lot of trouble in synthesizing populations based on spectra of local stars, in trying to correct for these absorption features so that weak emission lines could be measured. 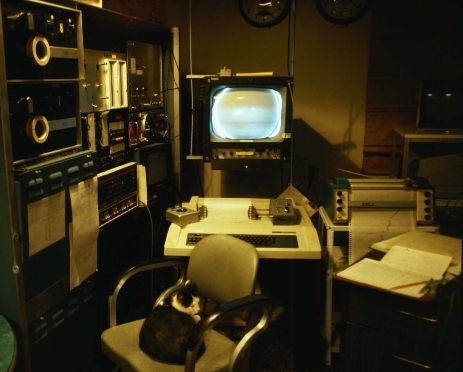 The view of the control room (in 1981) shows some vintage astronomical usage. Data taking was handled by a PDP-8 computer, upgraded to 32K of memory, and writing the results on either 32K 8-inch floppy disks or Dectapes. The switch panel on the front was occasionally useful for debugging corrupted programs (you may not want to ask). Communication was by means of a Decwriter glorified teletype, and display used a Tektronix graphics terminal. One could also use the Calcomp pen plotter. The cat did not fulfill its expected function, chasing the mice that tried to gnaw cables in the control room, while it did keep trying to eat my cookies and tortilla chips. At least it did serve as a chair warmer. The acquisition TV shows a pair of galaxies being observed, and (maybe) the dark apertures of the object and sky holes for the spectrograph. The Google Maps satellite image shows the adjacent military communication facilities (such as the radome used by the electronics people from Fort Huachuca) as well as the other domes from the University of Arizona instruments. And indeed, their transmission tests did have the effect you'd expect on data taking. Below is an older USGS image. 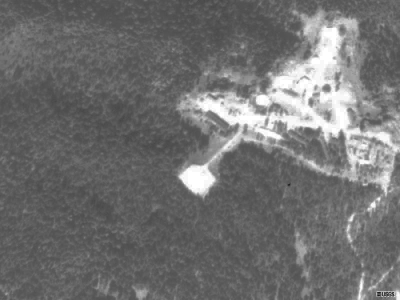 This telescope lies above center at the end of the driveway and building stretching westward (left), with the UA instruments toward upper left. The weather here can be very odd for southern Arizona. One can wake up in the morning to find a meter of new snow. Or, as happened several times lately, worst in the 2003 Aspen fire, one can have to evacuate as a wildfire rages up the slope.